A tiny orb of light poked through the dark ooze of evening. It made him nervous – very nervous. “Maggot-breath!” he hissed, “Your carelessness will see both our heads skewered by Bretonni lances before we’ve even begun!” Another snap of fingers and the light was extinguished. The brief glow had illuminated the head of his smaller companion, its grotesque face a near equal to its fetid stink. Again, as it had so many times before, the real risk of betrayal loomed heavy in his thoughts. Here's my entry for this year's Anniversary Literature Competition. I see I may be the first to submit a piece, which may or may not be a good place to be in the queue. Herein lies my entry for the 2010 Anniversary Literature Competition. It is my first work of writing submitted for any competition. The story consists of exactly 2976 words. Spelling and grammar are American English. Please enjoy! I have strived for the last few years to come out with an open, strong campaign system. I had come out with a version which has now been marked outdated. After taking it back to the drawing board, I have found myself with a success! A few tweaks will always be needed, of course, and I intend to edit this article as it comes up from questions asked by players, but besides that I would like to present to you "Campaign Systems - World Conquest". A Campaign System for territory/map conquering. Though in human years the Round Table is a mere infant, five years is a long time on the fickle internet. Indeed, you might be surprised to learn that that epitome of the web culture called Youtube shares the same age as our esteemed home. Just like the former did for videos, the latter has become the established source for the Warhammer army of Bretonnia. Gamers have come and gone but the quality of the content – its discussions and articles - did not change over the years. Another indicator of the age of this website is to count the rings this website made: the perfect circles it endured when the game itself changed editions. 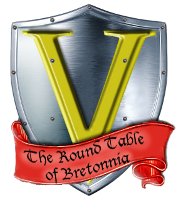 In September 2005 the Round Table opened its doors for the first time, continuing the tradition set by Earl Cadfael's Bretonnian army many many years before. A large stream of refugees from Chateux Montrefort arrived in 2006, uniting all Bretonnians under one banner here. In 2010 we then survived the transfer from 7th edition to 8th edition. 2011 might be the year the Bretonnians finally get updated but this year is more special to the site in a whole. We’re going to kick in our sixth year – as is traditional - with the start of two to three new competitions in which you can vie for the respective medal. We are also nearing our 4000th registered member, as new knights and ladies sign up every day. Be sure to watch this announcement for updates on the upcoming competitions, and celebrate with us our 5th anniversary! This was part of a project started by myself and Gaulord once Chateau Montreford fell to the ravages of a bad server. Unfortunately the project never took off and eventually everyone went their separate ways with me and a handful of other members landing here at the Roundtable. This is what is left of the project from 4 years ago. Bretonnia Tactica: Virtues in 7th Ed.